Minerals and rocks are stable only under the conditions at which they form. If the conditions are change, the rocks will change to adapt to the new conditions. The principle is obvious if we raise the temperature a couple of thousand degrees; rocks melt and form magma (liquid rock), which then cools and crystallizes to form igneous rocks. These and other processes of diagenesis or transformation are the rationale for the Rock Cycle, that proves that all rocks can be transformed into other rocks (Rock Cycle Discussion). For instance, Granite (pictured right) is an igneous rock that crystallizes from magma between 1000 and 500 degrees F in large Batholiths below ground. Granite is seemingly very durable, and a preferred building stone for these reasons. Yet, when exposed at the earth's surface, granite will decompose (weather) into something new to reach a stable state under it's new conditions on the earth's surface. After a few tens or hundreds of thousands of years, the Granite will break down into minerals in equilibrium with it's new environment. Link here to see details on the weathering of a granite. Note: A source of confusion is the difference from mineral names to rock names. Clay is a mineral that forms from the weathering of feldspars. Clay is very fine grained; it is the mud on your shoes, or the mud (suspended Clay) in a river or pond. When Clay is deposited it becomes shale. Calcite is a mineral with rhombohedral cleavage that reacts with dilute hydrochloric acid. 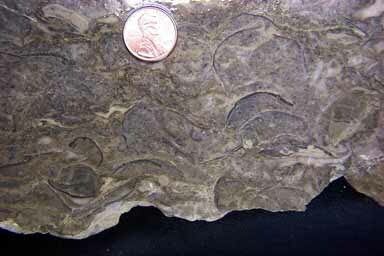 As a sedimentary mineral it exists either as Micrite ("lime mud", that is as fine grained as Clay) or as larger pieces such as sea organism skeletons (i.e., foraminifera). Together they form the rock Limestone. Quartz sand is released as grains from the parent rock by weathering. quartz is very resistant so it changes very little after that. It remains quartz. Imagine an average continental igneous rock such as a granodiorite (pictured right). It contains Quartz, feldspar, and mafic minerals: a representative sampling of the Eight Rock Forming Minerals in an igneous rock. 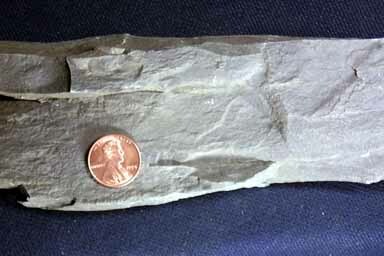 If this rock undergoes all sedimentary processes of 1) weathering, 2) transportation, 3) sorting and 4) deposition, the result would always be the same and it would become Quartz Sandstone, Shale, and Limestone separated from each other in different depositional environments: the beach, near shelf, and far self. Sedimentary systems work this way because of two processes. The breakdown of one mineral/rock into another. Of the Eight Igneous Rock Forming Minerals all are subject to degradation (weathering into something else), except Quartz. Quartz does not weather and will survive in the system relatively unchanged. The remaining seven rock forming minerals all dissolve to make the sea salty, or decompose to form new minerals stable at the earth's surface. Orthoclase, for example, breaks down to form Clay, and the calcium in Ca Plagioclase goes into solution to form CaCO3. The simple, ideal model predicts three end products, Quartz sand, Shale, and Limestone, which together compose the vast majority of sedimentary rocks. The second process is sorting during transportation. The sand and Clay are increasingly separated and sorted as they travel downstream away from the source (i.e., mountains or uplands). Quartz sand, which rolls and bounces along the bottom, does not transport as easily as Clay, which travels in suspension. The CaCO3 is in a dissolved state and therefore just travels with the water. These three weathering products do not transport equally well, and so become separated. The final separation takes place at the ocean Shoreline (image to right). Here we see river transported sediment entering the ocean. Waves crashing on the beach keep the sediment continuously stirred up. Quartz, being relatively heavy, settles quickly to the bottom, the Clay remains in suspension until it drifts to the quieter near shelf, where if finally settles to the bottom to form Shale. Finally, the dissolved CaCO3 precipitates out of suspension in the far shelf, beyond the range of sand and Clay to form Limestone. 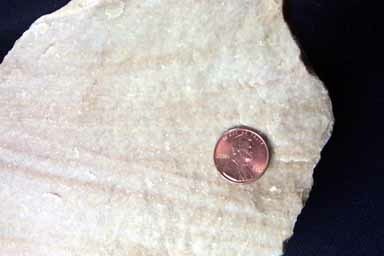 The Calcite is deposited because plants and animals extract it from sea water and use it to build their skeletons. After death their Calcite skeletons form the Limestone sediment. In the sedimentary model, Quartz Sandstone, Shale, and Limestone can be thought of as "attractors." All the processes in the sedimentary system are "attracted" to these three end products. The simple, ideal model begins with a granodiorite, but any source rock has the same three attractors, and this is true even if the components to make one of the attractors is not present in the source rock. Sandstones are particularly important, not only because they are common, but also because they contain a lot of information regarding how far a rock has traveled. Near the sourceland sandstone contain lots of incompletely weathered minerals and rock fragments. The more the sand transports the more these weatherable components transform into Clay and dissolved minerals (e.g. Calcite), leaving behind more and more Quartz as the only remaining, unweathered sand grains. At the end, then, all the rock forming minerals transform into other sedimentary minerals, except Quartz. Sandstone composition is thus a measure of how close a sandstone has gotten to the Quartz attractor - the end product of the simple ideal model. This leads to the concept of maturity. MATURITY - a relative measure of how extensively and thoroughly a sediment (sand size and larger) has been weathered, transported and reworked toward its ultimate end product, Quartz sand. The definition of maturity makes it clear that our interest in sedimentary rocks is in their evolution, and ultimately we want a classification that allows us to explore that evolution. The simple ideal model can be achieved, however, only in a region that is tectonically stable (tectonics has to do with earth movement, and the structures that result). For example, Stage A and Stage I of the Wilson Cycle. The simple ideal model is what tectonic stability gives you, and is about the only place that Limestones are deposited. Most clastic sedimentary rocks (i.e. sandstones and Shales), begin their history in an area of tectonic instability, a region of mountain building, such as Stage E or Stage F of the Wilson Cycle. Thus, achieving the three sedimentary attractors of the simple ideal model is not easy, and completely mature sandstones are not common.